I remember back in the beginning when I was sick and still working. One of my co-workers sent me this video clip. I loved it and had saved it on my computer. Somewhere along the line it got deleted. I was thinking of it today and decided to search youtube for it. Whenever I was having a really bad day, I would sit at my desk and pull up the video and watch it. I hope you enjoy it. We are all SURVIVORS. Our circumstances may be different but we have all survived something in our lives. This post was originally shared on November 27, 2012. I continue to tell others that they are stronger than they ever could imagine. When faced with struggles, we can lie down and give up or we can choose to fight. I have been a fighter from the beginning with this illness. I fought through the depression and loneliness it caused, I fought for the courage to continue on when I wanted to give up and die, I fought for what was right in the workers’ compensation case, and I continue to advocate for others by sharing my experiences. 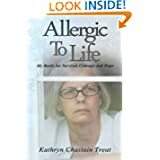 I wrote “Allergic to Life” to share my journey and let others know not to give up hope. I discovered Pinterest about a year ago and began collecting quotations. I think this quote goes well with this post. We never know how strong someone is unless we can walk in their shoes. A friend recently posted this quote on her Facebook page. “You never know how strong you are until being strong is the only choice you have.” — unknown. Being strong is ultimately the only choice. We push forward and do what is necessary despite discomfort, pain, lack of food choices, sleeping on cots, severe reactions, surgeries, grieving for our former lives, etc. I believe that those who have said I don’t think I could deal with all that you deal with would find an inner strength that they didn’t know they had. Sure there is depression (I have and do deal with it) but the strength to fight and the will to live has kept me pushing forward in the battle for survival, hope and courage. I have written in my book about these types of comments. In my book I quote from a journal entry of September 26, 2004. I have decided that I have to stand strong. I have to deal with this. I have to make others aware of what mold does. I have to offer whatever I have learned and share whatever I have done that helps me. God kept me alive during reactions that I thought I surely would die from to be a spokesperson for others. When you don’t feel that you are strong enough, dig deep within. That strength is there despite your fears and pain. God kept me alive for a reason and I believe he gave me the strength I didn’t know I had. Today I am being featured on Indies Unlimited in their Book Brief Section. Please check it out here. Their post is becoming live at 1:00 p.m. PT today. I am away at my book signing. I hope you are able to get to it through the link I provided. I will check it again once I get home. I kept my granddaughter today because she wasn’t feeling well and didn’t go to preschool. My daughter had an errand to run after she finished her classes before picking her up. It was fine with me, I did most what I was going to do while she was here, lying on the bed or on the loveseat watching movies. My daughter arrived not long ago to pick up my granddaughter head home. She walked in with a gorgeous gift bag and said it was for me. I opened it up and this is what I found. This says so much about my fight and my book title. I don’t look this smart but I love the retro photo. I love this quote from the Bible. Thursday, March 14th, I have the photographer coming to work on photos for my front cover. Today I signed the contract to have the cover designed and a webpage created (this project starts on March 28th). The plan is to have the cover design and webpage created by mid May. I hope to have everything submitted to the publisher by the end of May. If everything goes according to plan, it is possible that I could have the book by July or August of this year. I think I see the light at the end of the “book tunnel”. My Christmas tree is up and decorated. While I don’t have many other decorations to put out compared to my “old life” when I had decorations everywhere, my tree is up and for that I am grateful. Many of my environmentally sensitive friends are not so fortunate. Some of my friends are not able to have such a tree (real or artificial). My tree is decorated in all metal ornaments with a few resin ornaments to fill in the gaps. A very dear friend bought an artificial tree seven years ago and still cannot bring it into her house. Some of my friends are even less fortunate in that they have no safe place to call home. I am thankful each day for what I have managed to regain since this merry-go-round of illness began thirteen years ago. While my life is not what it was before, it is better than I ever dared hope for. There was a time when I didn’t know if I was going to live or die from all the reactions and infections. I feel deeply for those who have just started this journey and for those who have been on this journey as long as I have and are struggling daily to survive and find the hope and courage they need to carry on. To the men and women I have met on this journey, I am grateful to call you my friend. We have shared tears and anger but we have also shared laughter and joy. Laughter at finding a way to put some humor into our crazy worlds and joy in each new accomplishment and step forward we make. I recently read this. Those are powerful words! I think in the midst of my battle for survival and the courage and hope to keep going, I sometimes forget that I am not the only one fighting a battle. Others are fighting just as hard. Their circumstances may be different but their battles no less frightening and painful than mine. I remember sometimes when I would be in the midst of feeling so lonely, so isolated, so scared that I wouldn’t get better, my husband would remind me that “so and so” was much worse off than me. Of course, in the midst of my own hurt, I didn’t care if someone was worse than me. Those were not words I wanted to hear. It would make me angry. Angry at him and angry that my pain, isolation, loneliness and fear were not being taken seriously. Eventually I would calm down as the “fight or flight” action dissipated. Then I would feel bad that I hadn’t cared about the others, about anyone worse off than myself. I am trying to not let my own situation overshadow all those who are also suffering. I am also trying hard to be kinder to myself and be more accepting of my limitations.